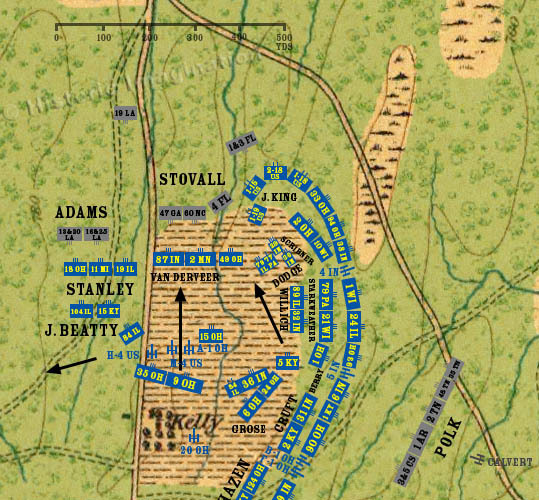 The attack of Breckinridge’s Division is contained, and the Union forces begin to assemble for a counterattack to drive the Confederates from Kelly Field. The Regular Brigade and the two frontline regiments of Van Derveer’s brigade engage Stovall while reinforcements assemble. Van Derveer’s two supporting regiments arrive. From Willich’s brigade, the 49th Ohio moves north to engage Stovall directly, while the 15th Ohio continues to the assembled artillery to support them. The 5th Kentucky from Berry’s brigade also turns about and heads north to help.